Samosir Island is a large volcano island in the middle of Lake Toba. It means Samosir Island become an island within the island of Sumatra. The only one in the world! 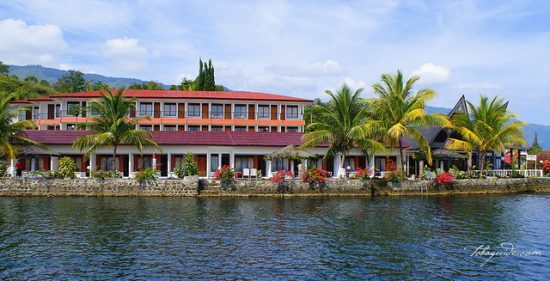 Samosir Island and Lake Toba is a great combination as natural and cultural attractions. The three main places in Samosir is known as 3T, Tuk tuk, Tomok, and Tele. 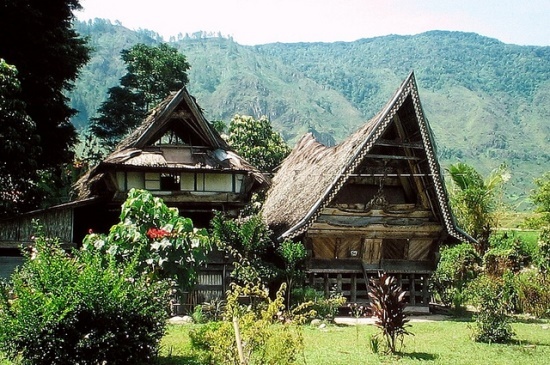 Here we can see traditional Batak house, Sigale-gale performances, eats traditional Batak food, and of course, enjoy the Lake Toba scenery. Before visiting Samosir Island, you can read our travel story here. What can we do in Samosir Island? Tuk tuk is the main gate of Samosir Island, while the ferry arrived here from Parapat (the only access to Samosir Island). 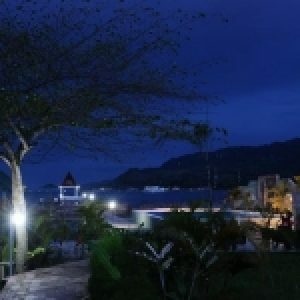 This area is also the most populated area in Samosir, where we can found hotels, cottages, and restaurant, and also water sports facility. 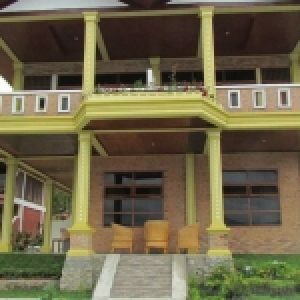 Hotel Carolina is the most famous accommodation in Tuk tuk Samosir. It is located just near the lake shore. It has a nice restaurant with a lake view-verandah. Besides that, they have a private area in where visitors can swimming with a diving board and pontoon freely. 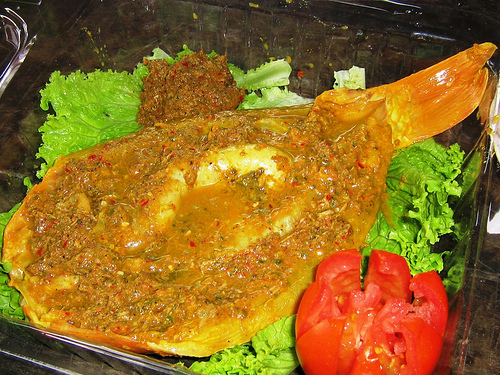 For food, you must try Bataknese traditional food called saksang and arsik. Saksang is made from small-diced pork cooked with traditional herbs and spices. Arsik is like sashimi, where the goldfish is cooked by the lime and spices. Oh, before I forget pork is non-halal food. You need to remind the hotel or restaurant staff for halal menu if you mind. While enjoy the food, we can feel the wind-breeze and fresh air from Lake Toba. In Tuktuk, we can find several water attractions, such as banana boat, kayaking, jetski, or tour around lake. 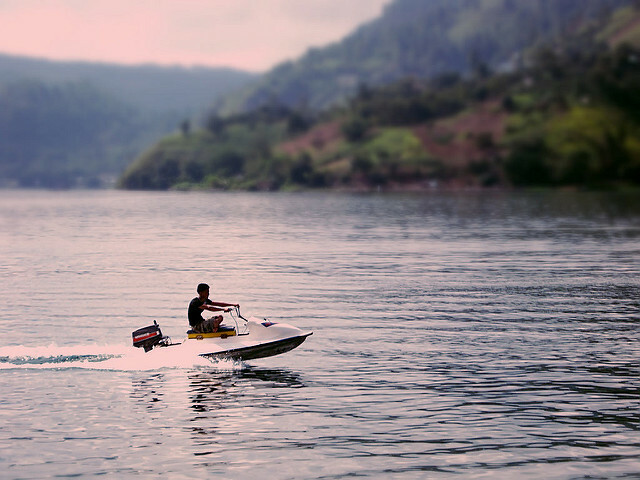 It costs 150.000 rupiahs for jetski, and 1 million rupiahs (80 dollars) for the tour using traditional boat. Maybe for you it is quite expensive, but I think that was very worth it. 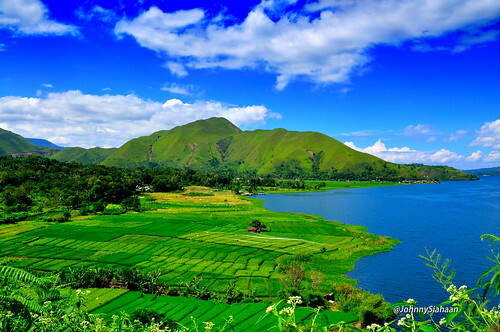 You can enjoy the beauty of Lake Toba closely. After enjoy our lunch Saksang, we are going to Tomok village. Tomok is a small village at Samosir Island. It is a one hour walk from Tuk-tuk or 15 minutes by motocycle. 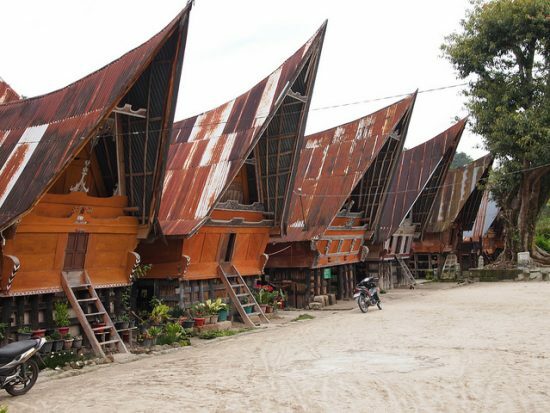 In Tomok, there are some beautiful traditional Batak houses. It has unique structure above the ground with boat-roof. In Tomok, we can visit the grave of former king Sidabutar, with his tomb and sacophagus. In the afternoon, you can see local people playing Sigale-gale. Sigale-gale symbolizes the spirit of the deceased. This doll can dance alone, even crying when someone is dead. For over centuries, Sigale-gale stands as mythological doll and belief in Samosir. But, after the Christianity era, people don’t believe spirit of the deceased enters the doll body, made it can dance or move. 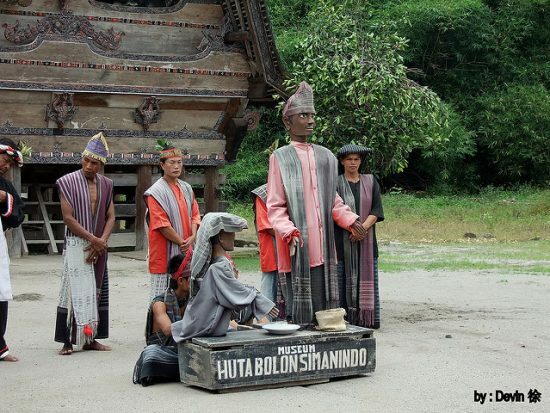 But, while it was very popular in Samosir, we can still see Sigale-Gale performances. The show usually be held near Tomok. You will be amazed by the various movements that detail-like eye twitching, head waddle, even his body is able to squat and bend over. We can take photograph also with Sigale-gale. Don’t be afraid! 6. Samosir and Lake Toba from the heights? We visited the peak of Samosir Island in Tele. We’re discovering the sights of green hills. Don’t forget to prepare your camera! 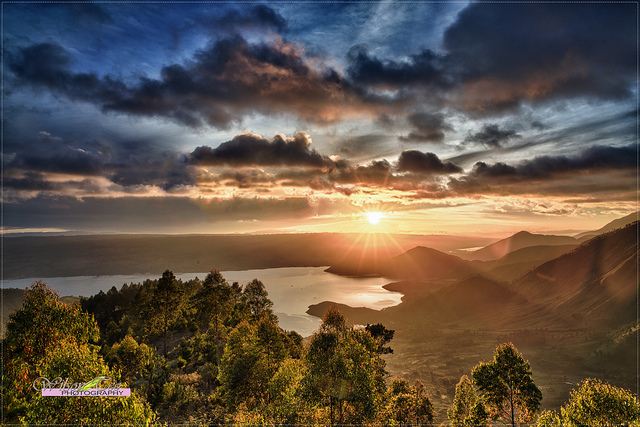 From Tele, you can see the beauty of Lake Toba and Samosir Island from the top hills. Nice and very beautiful! 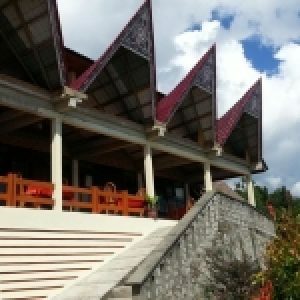 You can take several flights from Jakarta, Surabaya, Bali, Makassar, or Lombok to Kualanamu International Airport in Deli Serdang and then travel onwards by land to Parapat, the town by Lake Toba. 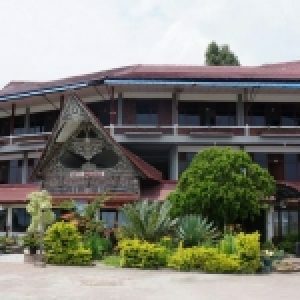 Parapat is about 4 hours by car from Medan or 4-6 hours by public bus. Parapat is connected to Tomok and Tuk Tuk on the Samosir Island by a ferry. There are one journey every one hour. There is a regular ferry service, every half hour, between Tuk-Tuk on Samosir Island to Parapat. The ferry runs every hour between 7.30am and 18.00 (or 19.30 during peak tourist seasons). The cost of the ferry is 10.000 rupiahs. When you plan to travel around Samosir, you can rent a motorcycle for a day or two for 100.000-150.000 rupiahs per day including the gasoline. You can reach Tomok, Tele, and Tuk tuk easily by using motorcycle.